↑ अ आ Mitchell, T.J.; Smith, G.M. (1931). Casualties and Medical Statistics of the Great War. London: HMSO. पृ॰ 6. OCLC 14739880. ↑ अ आ Dumas, S.; Vedel-Petersen, K.O. (1923). Losses of Life Caused By War. Oxford: Clarendon Press. पपृ॰ 57–9. ↑ अ आ Matthew White. 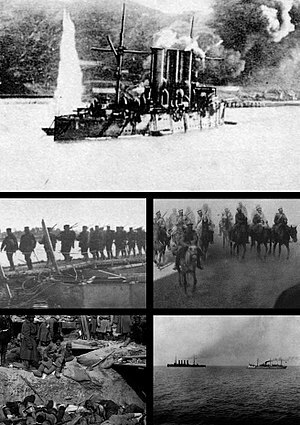 "Mid-Range Wars and Atrocities of the Twentieth Century - Russo-Japanese War". Historical Atlas of the Twentieth Century.